Trying to comply with the McCleary ruling, Washington state has poured billions of dollars into fully funding basic K-12 education. But school districts are still spending millions of dollars in local property-tax money for costs like transportation and building maintenance. OLYMPIA — Washington state’s elected officials in recent years boasted about fully funding basic K-12 school costs such as transportation, supplies and building maintenance. But even with the increases, school districts around the state are still spending local property-tax levy money to cover basic costs such as busing for students, curriculum and building maintenance. The state Supreme Court’s 2012 McCleary decision ruled that Washington violated its constitution by underfunding what it costs to provide a basic education at the state’s schools. In response, lawmakers and Gov. Jay Inslee since 2013 have poured billions of dollars into the education system. 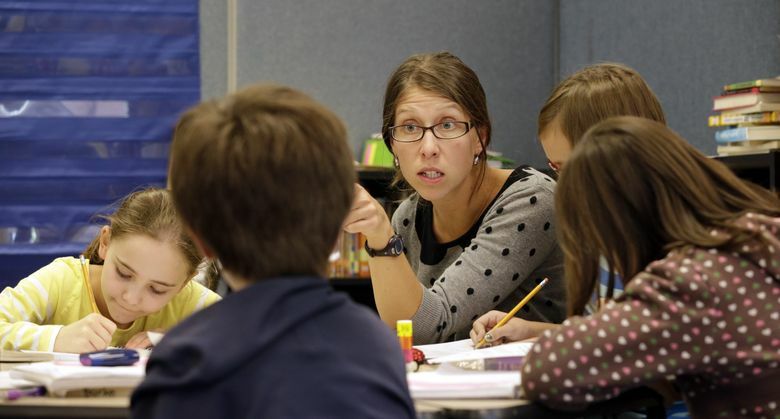 Lawmakers and Inslee have now turned toward the biggest remaining part of McCleary: how the state will fully pay for teacher and other school-worker salaries. Right now, those costs are often supplemented by local property-tax levies in the districts. Even as the focus has shifted to paying for salaries, school officials and others say the state’s recent funding increases don’t go far enough to fully fund other basic education costs. Data gathered by The Seattle Times show six school districts in the Puget Sound region are expected to spend a combined $20 million in local levy property-tax money on materials and operating costs for the 2016-17 school year. And those districts represent only a handful of Washington’s 295 school districts. Schools sometimes use local levy money for materials and transportation costs considered above and beyond basic education. But a budget proposal by the state Office of Superintendent of Public Instruction estimates that in the 2015-16 year, 155 school districts didn’t get enough state funding to cover basic transportation costs. A fix recommended by that proposal would cost about $47.5 million in the next two-year budget. Thomas Ahearne, lead plaintiff in the McCleary decision, argued last month before the state Supreme Court that the state must do more to fund transportation and materials and operating costs. “They still aren’t fully funding the actual cost of implementing the state’s program of basic education,” Ahearne told the justices in a hearing to determine whether the state had made adequate progress in funding basic education. Bill Keim, executive director for the Washington Association of School Administrators, said fully funding school salaries is still the biggest task facing lawmakers. But, “there seems to be an assumption that they’ve funded everything else,” Keim said. Some lawmakers, as well as Gov. Jay Inslee’s office, acknowledge that the state may have to do more to cover costs for school transportation, supplies and operating costs. “The formulas aren’t perfect,” said Rep. Chad Magendanz, R-Issaquah, who sits on the Education Funding Task Force. “We have heard clearly from school districts around the state that while the Legislature has said it’s fully funded, it’s not enough for the districts,” said Sen. Christine Rolfes, D-Bainbridge Island, another task force member. In an email, Inslee spokeswoman Tara Lee wrote that the governor’s office has heard current funding formulas “may still be problematic for some districts.” The office “will continue to work on the issue,” Lee wrote. In their 2015-17 state operating budget, lawmakers and Inslee boosted state spending on increased materials, supplies and operating costs by hundreds of millions of dollars. But for the current school year, the Seattle School School District still plans to spend $2.1 million in local property-tax money on such costs. That is on top of the $63.4 million in state money for materials, supplies and operating costs. The biggest part of that local-levy spending, according to the district, is earmarked for facilities maintenance, which is considered part of operating costs. The Bellevue School District expects to spend about $4.2 million in local levy money — on top of the $24.4?million from the state — for materials and operating costs. Some of that levy money will go to costs like “ongoing maintenance such as roofs, flooring and mechanical and electrical systems,” according to a slideshow on the district’s 2016-17 budget. Other levy dollars in Bellevue will go toward technology and curriculum for students. The Renton School District plans to spend about $4 million in local levy money over and above the approximately $18 million in state money for materials and operating costs. Magendanz and others say school districts use some of the materials and operating money given by the state to pay for teacher salaries that the state isn’t covering. Therefore, when lawmakers and Inslee figure out how to fund teacher and school-worker salaries, “it’s going to take a lot of pressure off the other areas” of school budgets, Magendanz said. Some of those extra costs are also because of a backlog of needed repairs and upgrades for school buildings, Rolfes said. Ahearne and state schools Superintendent Randy Dorn also say the state allocates too little money for technology needed by districts and students. Even after the Legislature in 2013 increased state transportation spending, districts are still spending local property-tax money to cover those costs. Districts receive either the statewide average for transportation costs or that district’s specific costs for the prior year — whichever is the lower amount. Up to 20 school districts, many of them rural, are particularly hurt because the state’s transportation-funding formula doesn’t take into account the extra miles buses in some areas must drive in order to reach students, according to Dorn. One example is the North Mason School District, which covers part of Hood Canal and contains many lakes that buses must drive around. Because buses travel longer and more circuitous routes, “there is no driving straight to get kids to and from school,” said Dana Rosenbach, district superintendent. The district’s budget office estimated it would have to cover $100,000 in transportation costs in 2016-17 beyond what the state allocates. The Marysville School District for 2016-17 will get about $5.2 million in state transportation money — for its estimated transportation budget of $6.1 million. That means the district is expected to spend an additional $900,000 in local levy money on transportation, according to data from that district. The district doesn’t track how much of the local levy is used to strictly cover basic education costs. But the current budget doesn’t have “extra frills,” according to the district’s finance office. “If we got to 95 percent on costs,” with the funding improvements, “we’re probably closer to 92 percent” now, Dorn said. If changes aren’t made, state funding could dip below 90 percent of those education costs in the 2017-19 state operating budget, he added. But, “getting everybody to a reliable 95 percent is a good goal,” he said.